MPP France Gélinas asked for a minute of silence this morning in the Ontario Legislative Assembly to honour Gaétan Gervais. Gervais was born in St. Charles, Ontario. He spent his career as a professor of History at Laurentian University, specifically focusing on Franco-Ontarian history. 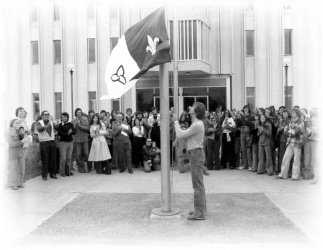 In 1975, in collaboration with Michel Dupuis, he created the Franco-Ontarian flag which is still flown today. Gervais has become THE preeminent specialist in Franco-Ontarian history publishing several books on the provinces francophone roots. His most popular work is the Franco-Ontarian history textbook entitled, “L’Ontario français” published in 2004. In 1981 he assumed the presidency of the “Conseil de l’enseignement en français” and began promoting the hiring of Franco-Ontarian professors. He has been involved in the Revue du Nouvel-Ontario since its foundation, and spent many years as a co-director. He was a founding member of the “Institut franco-ontarien.” He has worked for many organizations, including the New-Ontario Historical Society, the Ontario Heritage Foundation, and the Franco-Ontarian Folklore Center. Mr. Gervais received an Officer of the Order of the Pléiade; the highest rank held by a person in Northern Ontario.